and my social media followers. * Not a vendor but would like your name shared? I have opportunities for you as well. Please Contact me for more information on sponsorship. Please check the Cookiexpo website for official activities and timeline. It is subject to change at any time. Accommodations: DoubleTree by Hilton Hotel. It is in walking distance to the Convention center, near Miami’s International Airport. So that's the summary of the convention. Now let's talk about what I'll be teaching! This is TENTATIVE. I'm sure there will be changes! *****SugarTalks - Thursday: 15 minute sessions open to participants. No extra charge. I don't know the times yet (or even if there will be specific times). Crushing it with Instagram - Instagram is where it's at! If you have a small business, Instagram is the best social media platform out there for you. I ignored my Instagram account for years before realizing its potential. Since then, I've been studying how it works and have been using it with intention. My follower count has soared. I'm reaching my target market, turning them into paying customers. I'll give you my top 10 Instagram Tips during this talk to help you grow your account and business. *****Pre-Show, Add On, Workshops: Thursday: Must pre-register. 50 - 60 minutes each. These are NOT included in any of the convention or vendor hall passes. They must be purchased separately. Each workshop comes with an ebook that includes all of the class information for you to refer to later. These are lecture type classes. Not hands-on decorating. If time allows, I'll take questions at the end of each class. Times to be determined. Cookie Business 101 - $47 per person - Are you ready to start a cookie decorating business? I'd love to help you! I'll talk to you about the path my business has taken, ideas to help you set your policies (that will save you headaches later! ), options on products and services you can offer, advice on choosing a business name, creative ways to find a commercial kitchen that is affordable (and will actually make you money! ), and much more. If you've looked into commercial kitchens and have been told that they rent for $20 - $30 per hour - have no fear! There are ways to rent that ARE affordable! I've done it, as have many others (and it isn't by paying an hourly fee)! I'll guide you to set yourself up for a legal business that can succeed. You can do this! * You will receive a coordinating ebook with all of the class information that you will have later to refer back to. (The ebook will be emailed to you.) During this class, I'll go over the highlights of the ebook. If time allows, I'll take questions at the end of class. Cookie Pricing - $47 per person - If you're in the cookie decorating business, this is a veeeeery important topic! If you're wishing you were charging more for your cookies, this is the class for you. I'll talk to you about bookkeeping throughout the year easily so that you can evaluate each month to see how you're doing, and at tax time you'll be ready in no time. I'll show you what I use to create professional invoices that will get you paid quickly. Most importantly we'll discuss PRICING. Get ready for a pep talk. You CAN make a decent profit decorating cookies but only if you price well. I have a lot to say on this subject that involves talk of Hondas and Jaguars and even cheese and guac. It'll all make sense if you join me! This class is so much about encouraging you and reminding you of your worth! You can do this and actually make money. Really! * You will receive a coordinating ebook with all of the class information that you will have later to refer back to. (The ebook will be emailed to you.) During this class, I'll go over the highlights of the ebook. If time allows, I'll take questions at the end of class. How to HOST Cookie Parties and TEACH Cookie Classes -$47 per person - Are you ready to share your cookie knowledge with others? Well I'm ready to share my knowledge on how to do so! Hosting parties and teaching classes can be a very nice supplement to your cookie business. I host monthly parties with a max of 17 people at $43 each. That comes to $731 for one party. I teach private cookie decorating classes, charging $225 for one person. Let me show you how I do it. I'll talk to you about the difference between a party and a class. It's HUGE! The number of people, what you teach them and how much you get paid - it all depends on whether you're hosting a "party" or teaching a "class". I'll answer the questions that I'm asked so often....How many cookies per person? Do they share icing? One icing consistency or two and how many colors? How do they get their cookies home? What supplies do I need? You'll be ready to host parties and teach private classes! You can do this! * You will receive TWO coordinating ebooks (one on parties and one on classes) with all of the class information that you will have later to refer back to. You will also receive a roster form, piping practice sheet and icing consistency handout for classes. (The ebooks and documents will be emailed to you.) During this class, I'll go over the highlights of the ebooks. If time allows, I'll take questions at the end of class. How to Take and Complete Cookie Orders Efficiently -$47 per person - Are you just starting your cookie business and wondering how to organize your orders? Or are you already in the biz but feeling scattered? I can help! I'll talk to you about organizing the way in which you take orders so that you can complete them efficiently! I'll teach you my step-by-step method of taking orders. This will make sure that you never miss an order or a detail when it's time to decorate. * You will receive the two forms that I use and are necessary to taking and completing my cookie orders efficiently. * You will also receive a coordinating ebook with all of the class information that you will have later to refer back to. (The forms and ebook will be emailed to you.) During this class, I'll go over the highlights of the ebook. If time allows, I'll take questions at the end of class. *****Core Class: : Friday: Included with Convention ticket only. Cannot be purchased separately. This class will be taught repeatedly, all day Friday, to all participants, as will the other Core Classes. Approx 60 minutes per class. Hands on decorating. All experience levels – beginner to advanced. Royal Icing Transfers for the Win! - These little gems will become your new BFFs. Royal icing transfers are decorative little candies that you can make. Royal icing is piped into different shapes onto a template and allowed to dry. Then they're peeled off and added to cookies, cupcakes, and cakes as an edible embellishment. It's not all about looks with these little beauties. Their purpose is mighty. They're crater-resistant, they save time, are a great way to use up extra icing, can cover mistakes in a pinch, and there's no need for a projector to get uniform results. Making transfers is a skill you'll want to have in your back pocket. During this class, we'll make transfers together, flood two pumpkin cookies and decorate them with transfers. This hands-on decorating class is for all experience levels: beginner to advanced. 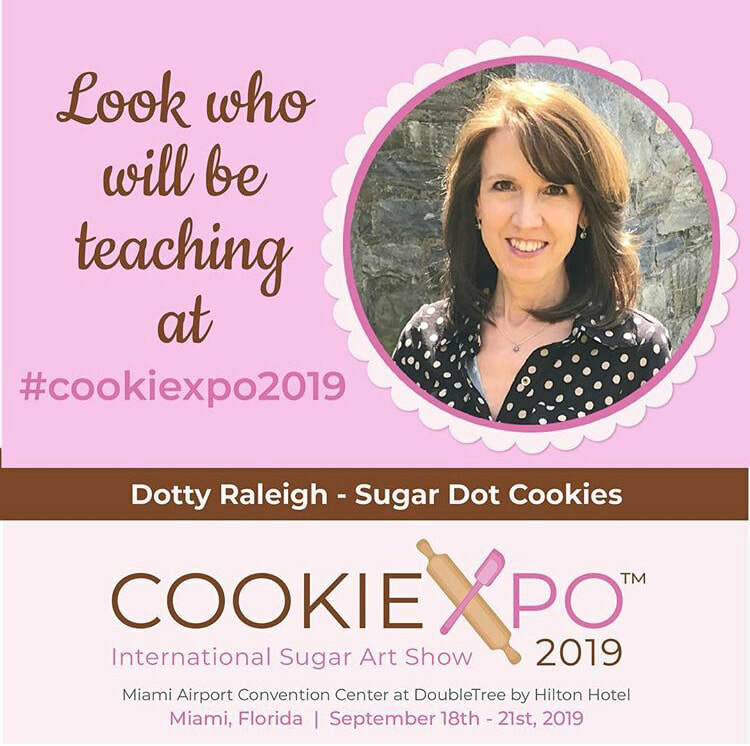 I'm so excited to be part of Cookiexpo 2019! I hope to see you there! Learn more and register on the Cookiexpo website.